Hello. How are you? That’s the ticket. Okay, yes, alright – look; I know that the tagline for www.howtowingameshows.com is “PRACTICAL TIPS FOR WINNING GAME SHOWS, FROM SOMEONE WHO’S BEEN THERE AND DONE THAT… TWICE!” And I also know that so far, I’ve only really talked in depth about the first of my two game show wins, on Temptation, in 2005. I GET IT; alright, alright, calm down, everyone… Sheesh! So today, I present the first of a four-part series on how I became – on the Big People’s Television at least, if not necessarily in real life – “Australia’s Brainiest Quizmaster”. 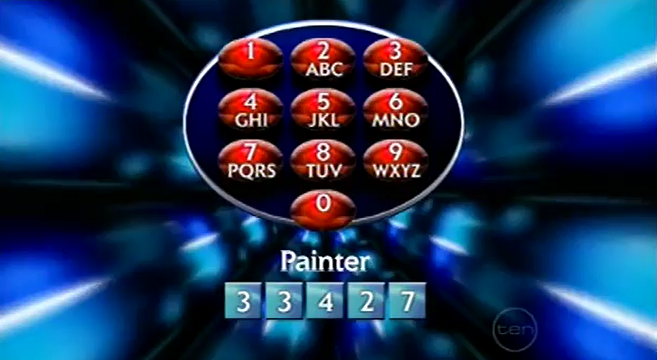 But first, a bit of background for you… Australia’s Brainiest Quizmaster was a one-off special that aired in Australia, on the Ten Network, on February 19th, 2006. Newsreader Sandra Sully, the host of ‘Australia’s Brainiest Kid’, and all the ‘Australia’s Brainiest’ specials. It came off the back of Australia’s Brainiest Kid, which was an adaptation of Britain’s Brainiest Kid. The success of that series saw Network Ten keen to keep the ratings coming, and so a series of Australia’s Brainiest specials was commissioned almost instantaneously. The first three specials were Australia’s Brainiest Comedian (whose winner, Mikey Robins chatted to me for the blog), Australia’s Brainiest TV Star, (whose winner, Julia Zemiro, also kindly gave me an interview), and the one I participated in… Australia’s Brainiest Quizmaster. And putting to one side the fact that “Quizmaster” usually refers to the host or compère (i.e. the question-asker, rather than the question-answerer), it really was great fun. And a special note: if you’d like to watch Australia’s Brainiest Quizmaster as I talk you through it, well, you can! It’s right here, in its entirety (even though I had to split it into 6 parts) on the How To Win Game Shows Facebook Page. And hey, if you felt inclined to “like” the Facebook page while you’re there… well, I’d sure appreciate it. … that I started to feel a whole lot less sure of myself. – The two Who Wants To Be A Millionaire millionaires – Martin Flood and Rob “The Coach” Fulton, and the first man to win the $500,000 on WWTBAM, Trevor Sauer. – And Sale Of The Century champions William Laing, Maria McCabe, Virginia Noel (who would also go on to win Series 3 of The Einstein Factor the next year), and the man himself… Cary Young. This could be embarrassing. Very publicly embarrassing. The first round was multiple choice, and I did not nail it. At all. Four clear winners advanced to Round 2, and we three also-rans, who didn’t do quite so well (William Laing, Virginia Noel & I) had to play for the two remaining places in Round 2, with a fast round of “Matching Pairs”. In this example, we had to match four capital cities with their corresponding countries, as quickly as possible. Fighting off instant panic as they all appeared before me, I went with the ones I knew first; Sofia belongs to Bulgaria, Budapest belongs to Hungary, Warsaw belongs to Poland and therefore Bucharest had to be the capital of Romania. I would not have been sure about Bucharest… but starting with the Familiar and working down to the Unfamiliar paid off (luckily there were only 4 pairs). Somehow I’d kept my head, and matched the pairs ever so slightly faster than Virginia. I was through to Round 2. And that’s where we’ll leave it for this week. Check back in next week, to see if I make it through Round Two of ‘Australia’s Brainiest Quizmaster’ without getting eliminated! This entry was posted in Brain Training, Game Show Winners, Managing Stress, Question Writing, Strategy, Tactics by Stephen. Bookmark the permalink.